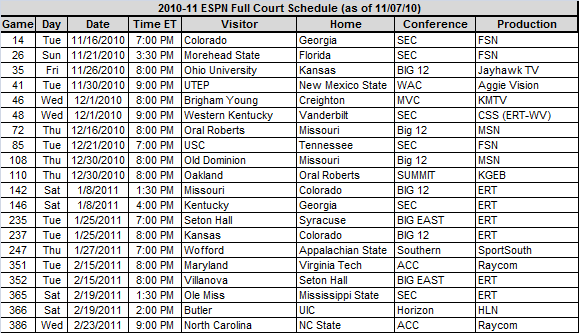 Once again this year we’ve been inundated with requests for our annual release and analysis of ESPN’s Full Court Schedule, which for some reason the WWL makes very difficult to find and use every year. You’d think that if they want us to pay $104 for this product, they’d make it considerably easier to know exactly what we were buying. Alas. Keep in mind that according to ESPN every one of these games is simulcast for free on ESPN3.com (previously ESPN360), so the decision point on whether to spend the hundy probably comes down to whether you enjoy watching games on a 15″ or a 50″ screen. We didn’t want the length of this post to be a mile long, so we’ve thumbnailed the entire schedule (which we re-organized in a useful way) below. Note: You’ll have to click the table in the new page to expand it to full size. A fully sortable Google Doc that we created containing the same information is also located here. 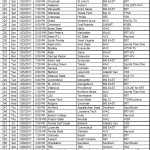 You can sort the table by your favorite school or conference if you like, a feature that ESPN with its boring .pdf format simply doesn’t provide. If that’s too much to look at, here are the twenty games that we find the most compelling on the package this year. There are some legitimately good games on this list, including several matchups where talented mid-majors having something to prove visit a ranked team’s gym (i.e., Morehead State @ Florida; ORU and ODU @ Missouri; Ohio @ Kansas). Additionally, some of the conference matchups later in the year could turn out to be important games for the overall standings and in terms of NCAA Selection Committee seeding (i.e., Kentucky @ Georgia; Maryland @ Virginia Tech; UNC @ NC State). Here are the schools with the most appearances on Full Court this year. If you enjoy bad Big 12 basketball (Iowa State and Oklahoma), then you’re in luck, but the package’s comprehensive coverage of the SEC’s Georgia (with probable first-rounders Trey Thompkins and Travis Leslie) and Mississippi State (with Renardo Sidney) should be interesting. Seton Hall is on FC fourteen times, and given the amount of talent the Pirates are bringing back with the level-headed Kevin Willard entering the fray, it might be worth catching several more of their games. And if you’re not getting enough of Jacob Pullen through the usual channels, the Full Court package will give you eleven more opportunities to fear the beard this season. Here are the games broken down by conference. The Big 12, Big East and SEC comprise more than half of the games on the package, so if you’re not a fan of any of those three leagues, it’s probably not worth the hundred bucks. We’re always a fan of getting an occasional glimpse of some of the better teams in the mid-major leagues, and the package provides 173 such games, including Utah State, Creighton, Ohio, Murray State, ETSU and many others throughout the year. Games are typically added throughout the year as well, so keep that in mind if you decide to make the purchase. We’re almost there, folks. This entry was posted on Sunday, November 7th, 2010 at 11:58 am by rtmsf	and is filed under 2010-11 Season Preview, media matters. Tagged: big 12, big east, creighton, espn full court, etsu, georgia trey thompkins, iowa st, jacob pullen, kansas st, kevin willard, mississippi st, murray st, ohio, oklahoma, renardo sidney, sec, seton hall, travis leslie, utah st. You can follow any responses to this entry through the RSS 2.0 feed. You can leave a response, or trackback from your own site.